Instead of the usual NIMBY We (Salt Spring) can help solve Salt Spring’s affordable housing crisis one person at a time by taking IMBY action. Salt Spring has studied the problem to death but there is little action on solving the basic problem of affordable homes for people who live on the island. 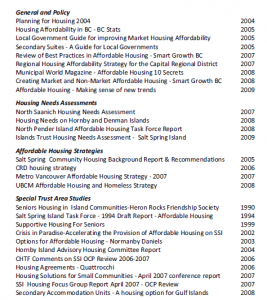 The island does not need another consultant to report on affordable housing. 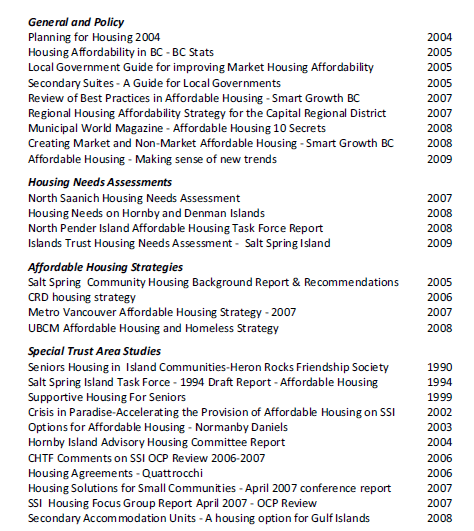 See references below for the excellent studies and or reports that have studied the studies already completed on or about affordable housing on Salt Spring. The Island Trust has taken some basic steps to solve the problem such as implementing the Secondary Suite bylaw 461. 461 Adopted Bylaw (Secondary Suites) Here is an info sheet on it Final Suites Info Brochure Oct 01 The trust studied this bylaw for 4 or 5 years before implementation in the summer of 2013. On September 10, 2014 (over a year after implementation) I checked with the CRD building inspection office as to how many people have stepped up and made a rental unit conform with the new bylaw. I was informed that six homeowners have made new legal suites or upgraded illegal suites to legal suites. The vast majority of suites on Salt Spring are illegal suites. I personally have been in hundreds of them and some are nice and some are not. Some are dank dark fire traps I would not let my dog sleep in. 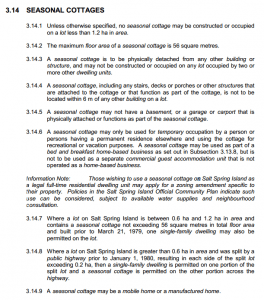 Information Note: Those wishing to use a seasonal cottage on Salt Spring Island as a legal full-time residential dwelling unit may apply for a zoning amendment specific to their property. Policies in the Salt Spring Island Official Community Plan indicate such use can be considered, subject to available water supplies and neighbourhood consultation. As per the (Needs Assessment 2009) There was very strong support for the legalization of suites and cottages as part of the solution to our affordable housing problems. As per (Toolkit 2010) 5.1.1 Secondary Accommodation (suites and Cottages) The legalization of secondary accommodations was the single most often cited tool throughout all the studies review, identified as one of the most readily available and inexpensive sources of an affordable rental housing. 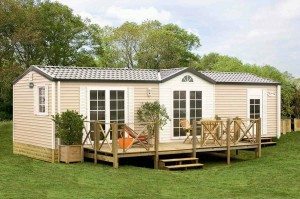 Secondary accommodation can take the form of suites located within (or attached to) existing residences, cottages, carriage house, granny flats (usually removable), cabins or mobile homes. 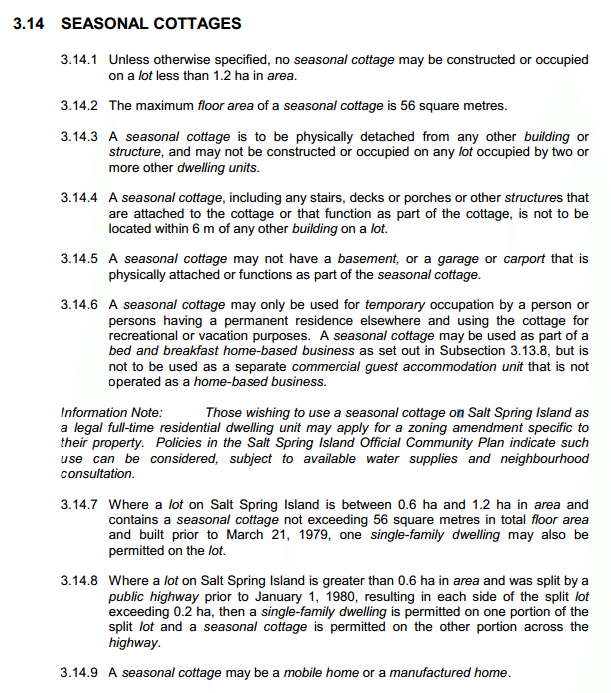 So basically someone can live in a Seasonal cottage on Salt Spring and be legal. According to Salt Spring fee bylaw 428 ssbylbaseadmfees0428 One can pay the $1,100 fee and amendment the rezoning of a property to permit a seasonal cottage for use as affordable housing. All of the preamble above was to verify and show that one can legally live in a Seasonal Cottage on a rural zoned property which is over 1.2HA (2.9652646 acres) in size. The solution is to put a qualified landowner and someone who needs an affordable home together. The mechanism to do this is a long-term (25-30 year) lease (an example could be Tenancy Agreement) of a small piece of the 1.2 HA property and the person who needs the affordable home who buys a 16×42 ft ( approx 588 sq ft) mobile home and puts it on the leased property. The lease would be registered on the title of the property and run with the property (if the property was sold the lease would stay in place conversely the owner of the mobile home could sell the unit). The landowner could charge $300 a month or so which would be a good long-term income stream for the landowner. Here is the floor plan of what a 601 sq ft mobile home would look like; M700CTM-Floor-Plan . These mobile homes cost approx $65,000 delivered and set up. The mortgage payments on a home like this would approx be in the $300-$400 per month range. The monthly ownership cost could be very close to being within the 30% (Needs Assessment 2009) cost of shelter for a single working person on Salt Spring. There are other costs in putting in a mobile home on a lot beside the Island Trust fee of $1,100. The CRD would want a building permit fee. There would be a cost of putting in the driveway, electricity and water line. There would also be a cost of hooking up to septic system (this might not be that substantial with the recent changes to the building code 2012 at to the use of greywater systems and the use of a composting toilet). Each of these administrative fees could be waived and or reduced by each agency and or funds could be raised via grants from foundations. There are numerous foundations with grant money available for affordable housing projects. Foundations such as the CRD housing, Real Estate Foundation, Salt Spring foundation, CMHC, etc… Note to reader most of the foundations would only donate to a not for profit. An umbrella foundation may have to be brought in to make this all happen. This is just an idea to get something happening on Salt Spring. This is a practical ideal based on what our zoning would permit. We are only limited by our ability to work together to solve this basic problem of providing low-cost affordable homes to people on Salt Spring. I would be willing to work Pro Bono for any landowner and or person who needs an affordable home on Salt Spring to make this or something like this idea come to light. Everyone who works on Salt Spring should have the fundamental right be able to live on Salt Spring in their own home, a home that is not a dank dark illegal basement suite, one they actually own and call home. With the high cost of Salt Spring land and the strict zoning, creative solutions are needed. Affordable homes for Saltspringers could be solved one person at a time In our own Back Yards. Lest take the IMBY approach like Vancouver has with the successful laneway homes. Salt Spring Island is physically bigger than the city of Vancouver one would think we could shoehorn in a few affordable homes here or there. Please note due to North Salt Spring water districts water hook up moratorium this proposal would only work on land outside of the water district.